BVP CET 2019 : The BVP or the Bhartiya Vidyapeeth is among the best deemed to be universities for dispersion of quality education. Students passing through here get better opportunities and the platform as required for their career. However to take admissions in the various course, one has to go through BVP CET 2019 Exam. Well, the exam provides admission to the B.Tech/B.E., LLB (BVP LAW CET 2019), M.Tech, MBA, MCA programs provided by the university and all other courses have their individual exams. Here in this article, willing candidates looking forward to join the university can review the complete details that are required to be known. We have assembled all essential information which includes admission procedure, registration, BVP CET 2019 Form, exam, its dates, centers, results and post result declaration information. The BVP Admissions will be important for a lot of candidates, thus here we bring easy to catch up details of the exam through which can learn the dates not to be missed. The candidates looking to get their admission for engineering courses have to go through the process of qualifying BVP CET Engineering. Qualifying the exam for B.Tech would allow aspirant get admission in Bharti Vidyapeeth offering courses in the following streams: Computer, Mechanical, Electronics & Telecommunication, Electronics, Information Technology, Civil, Electrical, Chemical and Production. Other conditions of admission: If in case seats in the university are there, interested students can also approach for admission through their score of MHT CET or JEE Mains. However, admissions for M.Tech are offered through the different exam. Here the courses offered are Chemical, Computer, Electronics, Information Technology, Civil, Electrical, Mechanical and the Nano Technology. The exam is not open for all, for giving the exam of BVP CET, one has to make sure that they fulfill the listed BVP CET 2019 Eligibility Criteria. Candidate must pass 10+2/equivalent exam from any recognized board. Candidates should have subjects like Physics, Chemistry & Mathematics in 12th. Candidates must have scored minimum 50% marks in class 12 in PCM (For SC/ST candidates, there will be a relaxation of 5% marks). MCA Must have a bachelor’s degree with mathematics. Secure a minimum 50% aggregate marks in graduation. MBA Must have a bachelor’s degree from any stream. Score at least 50% aggregate in UG programme. 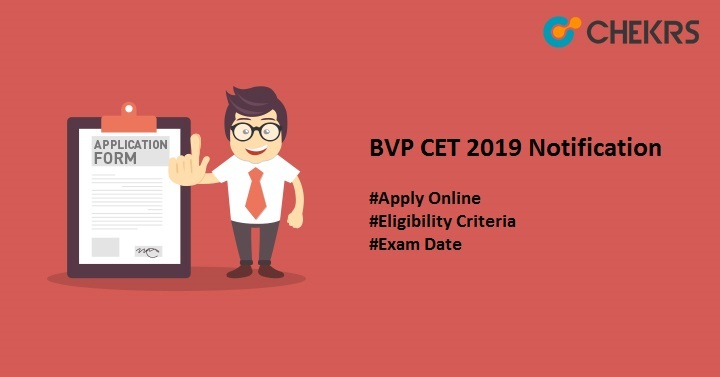 Minimum age should be at the time of applying for the BVP CET 2019. Indian/ NRI / Foreign candidates can also apply. In order to get presents for the exam, it is crucial for all to fill application form within the time given to all candidates. The BVP CET 2019 Application Form will be accepted online only. The BVP CET Online Application Form for 2019 admission will be available to all students from the month of January to May only. Exact dates, how to avoid mistakes and fill BVP CET Online Form, guidelines to fill the form will be illustrated to students separately here. Visit the website of BVP University. From the home page, take navigation to admission link available at the bottom of the page. Once the website will load, select the B.Tech option in the notices available for you. Firstly, login to the website using valid and long time usable credentials. Once done use the same details to access the application form. Once the application form will be open, fill every block as instructed. Once done click on the submit option and proceed to pay the fees of Rs 1,700/-. Your complete BVP CET Engineering Application Form Submission will be successful after this. The common entrance test of BVP can be attempted in English only. The nature of the test will be offline. Along with the BVP CET Engineering Exam Pattern, from here know some of the important guidelines for the exam. For the exam, students can only carry a card box along with them for giving the exam. As the exam method is conventional type, it is important for all to attempt the paper more accurately. As unlike other exams, the entrance test will be different as it consists of two subjects. Thus, the marks distribution and topics being asked in the exam gets varied. Here we will be listing important topics coming from the BVP CET Syllabus to ease your selection. Through the BVP CET Syllabus 2019 is provided here, aspirants can take a look at what is the frequency of topics being asked in the exam and their recommendation. The examination of the BVP CET will be in the conventional format and thus the admit card will prove to be helpful for applicants to know their exam venue. BVP CET Admit Card Download can be processed by students 7 days before the exam date. The downloading can be done online only. The process of downloading has been made easier here. Participants of the exam, have to come with a printed copy of their BVP CET Admit Card 2019 and essentially it will be the only document that can be carried in the examination hall. Other document to be carried at the test centers is anyone authorized photo IDs. Pune, Navi Mumbai, Vadodara, New Delhi, Hyderabad, Indore, Lucknow, Bangalore, Jaipur, Varanasi and Chandigarh. The competition in the exam is really tough and one has to prepare hard to give strong counter. For the same process, BVP CET Previous Question Papers will be most helpful. Through BVP CET Previous Question Papers pdf provided by us, contenders can learn what effective measures require implementation for getting a good score. The pdfs will be available on a shot span, making it easier for all to access them at free of cost. The Result announcement will be done in the form of rank announcement. As per the marks scored in the exam, ranks list will be prepared and answer will be announced to all in the month of June. In case of ties, priority will be set giving equal opportunity to all. Through thus page contenders of the exam can easily know BVP CET 2019 Result Date. As per the norms and rules set by the university entrance exam, counseling will be taken for every student who has qualified the common test. The BVP CET Counseling Schedule is in the month of June for all. The eligibility of top rankers is anyone scoring rank under 5000 can take counseling to get best college of BVP University. The syllabus provided here is what the university recommends all to follow, thus firstly, finish off it. NCERT is the best base preparation resource, hence set it as base and then increase the level. Take help of the previous papers to get the best outcome in results. Lay emphasis on faster solving through short tricks in numerical.